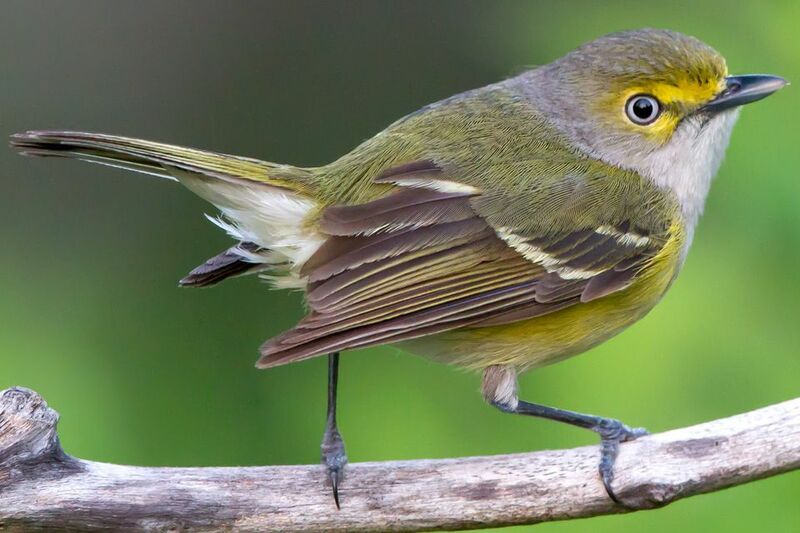 The white-eyed vireo is a small bird often confused for a warbler, and because of its secretive habits it can be difficult to see and properly identify. As birders get more familiar with these birds, however, the more they will notice vireos appropriately and recognize what makes them unique. Markings: Genders are similar with olive-yellow or olive-green upperparts. The head shows gray auriculars and a gray nape, and the face stands out with bright yellow lores that form thick spectacles around the eyes. The flanks are yellow and the chest and abdomen are white. The undertail coverts are also white. The black wings show green-yellow edging and two thin white or pale yellow wing bars. The dark tail has an olive-yellow wash on the outer edges. The legs and feet are gray-black. The eyes have a bright white iris, though the light color may not be noticeable unless the birds are seen at close range. Juveniles are overall paler with a plain face that lacks the bright yellow lores and only shows a faint yellow eye ring. Young birds also have darker eyes that may be gray or brownish but will lighten as they mature. These shy birds prefer dense, thicket-like habitats, often with thorns or brambles. They are found in the understory of forest edges, and they prefer deciduous woodlands. They may also be seen in overgrown fields and riparian areas, and while they may be found in densely vegetated suburban parks, they are rarely seen in urban areas. White-eyed vireos are year-round residents from northeastern Mexico along the Gulf Coast to South Carolina, including throughout Florida. During the breeding season, they expand throughout eastern Texas and as far north as Illinois and southeastern Iowa, and in the east as far as southern Ontario, Connecticut and Maryland. In winter, these neotropical migrants range south throughout Mexico and into Central America as far as Honduras. They also spend winters in the Caribbean, including Bermuda, the Bahamas and Cuba. Vagrant sightings are occasionally recorded much further west or north than these birds are expected. White-eyed vireos are more often heard than they are seen, and their typical song is an explosive cluster of different notes. Warbles, chirps, chips, wheezes and whistles may all be part of the song, which often ends with a sharp chip note. These vireos may also include mimicry in their songs, with notes similar to downy woodpeckers, American robins, house wrens and gray catbirds in their repertoire. Both male and female vireos sing, often late in fall or into the winter when other birds have stopped singing. When they sing, they typically perch higher up and in a more open area, offering birders better views. These birds are generally solitary or may be seen in pairs. During fall migration, they may also join mixed foraging flocks with other species. As they forage, they pick and glean insects from bark and leaves, occasionally hovering briefly as they seek out their next tidbit. They tend to stay lower in thickets, hiding under dense cover. These are monogamous birds. Males try to impress females by puffing up their feathers and spreading their tails. After mating, both partners work together to build a deep, cup-shaped nest using twigs, rootlets, grasses and paper from wasp nests, binding the structure together with spider silk. The inside of the cup is lined with finer grasses and fibers, and the outside is often decorated with lichen or moss. The nest is suspended from a forked branch or dense shrub and is generally positioned only 1-10 feet above the ground. The oval-shaped eggs are white with a few brown or blackish spots, with 3-5 eggs in a typical brood. Both parents share incubation duties for 13-16 days. After the altricial young hatch, males and females share feeding duties for an additional 10-11 days until the young vireos leave the nest. Most pairs raise only one brood each year, but southern white-eyed vireos may raise two broods annually. These birds are heavily parasitized by brown-headed cowbirds, and nest mortality can be very high. These vireos are not common backyard birds, but they may be tempted to visit yards that have thick, dense shrubbery for suitable cover. Minimizing pruning and choosing the best shrubs for birds can be helpful for attracting white-eyed vireos. Berry bushes for birds can also provide attractive winter food sources. Pesticides should be minimized to support healthy insect food sources. Aiming a mister at large, broad leaves can also be tempting for white-eyed vireos, as these small birds enjoy rubbing on wet foliage to bathe. In the field, these birds often respond to pishing and may present good views to birders who make squeaking noises. While these birds are not considered threatened or endangered, their populations have experienced minor fluctuations in recent years. Habitat loss can be a concern, and feral cats are a grave threat to white-eyed vireos because of the birds' low nesting habits.